A Common Reader Question: How Do You Deal With Cretaceous Shales? Every once in awhile I do try to use the geology I've been reading about to inform the geography or daily life of a story. So far I have not been particularly successful, so maybe I should take some geologic phenomenon and build a story, or at least an incident, around it. I like to hike the canyon country of the American Southwest. I usually end up there every other year, sometimes a bit more often. Much canyon country is colorful, sandstones and limestones in a wide range of reds and yellows. But much of this beauty is invisible from roads, except from scarce overlooks. The Mancos erodes to form wide, flat tablelands, easy to build towns and roads on. But much of this landscape is gray and relatively uninteresting. But when it rains, things can get sticky. Paved roads are fine in all weathers. The problem with the soil that forms from shale is that it turns into muck when wet, what the locals call "gumbo". A cloudburst turns a dirt road into a gray, greasy terror in just a few minutes. I remember when we climbed out of Escalante Canyon a couple of years ago. It had started raining in the morning and by the time we made the steep climb out and walked across the rock to our car, the road was a nightmare. We had to give up a proposed side trip to a side canyon to get out safely, after a long, sliding, perilous drive. At the end we met a lovely German woman with a huge amount of blond hair piled on her head who bemoaned the fact that she had not been able to get out to Spooky Gulch, one of the places we had considered going. The way she said those two words, "Spooky Gulch", made it clear that she thought this one of the most delightful places she'd ever heard of. It is a wonderful hike (I took my family there a few years ago), and I'm sorry she had to miss it. 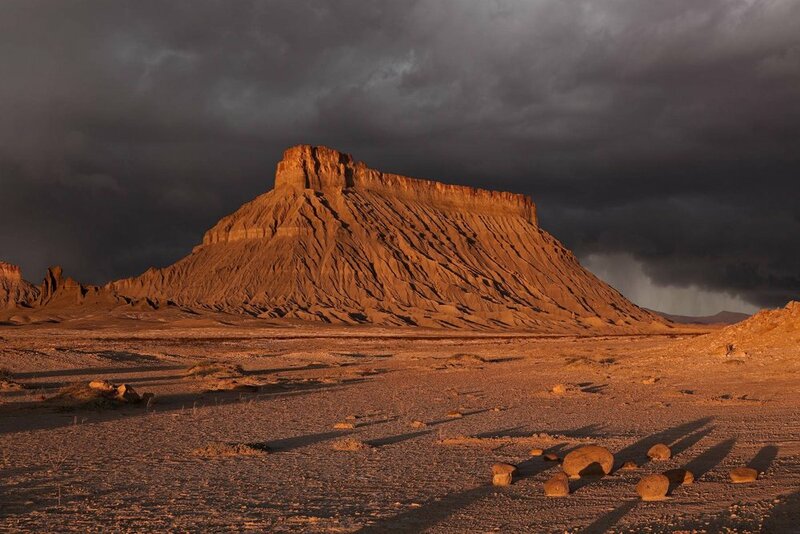 Soon after we enter the gray shale expanse, a well-maintained gravel road heads north, toward the landmark of Factory Butte and farther to the San Rafael Swell. Unlike most roads through Cretaceous rocks of the southwest, this one is quite good because it follows the bench of stable Ferron Sandstone rather than cutting across the shale. Aside from the fact that I have long wanted to spend some time in the San Rafael Swell, this is the kind of precise geologic detail I would love to work into fiction. Places where a dirt road is harder or easier to drive when wet might seem the result of chance, but really have a cause in the pattern of long forgotten seas. Have you ever noted the effect of geology on the events in your life? No, I have never used this question on a first date.